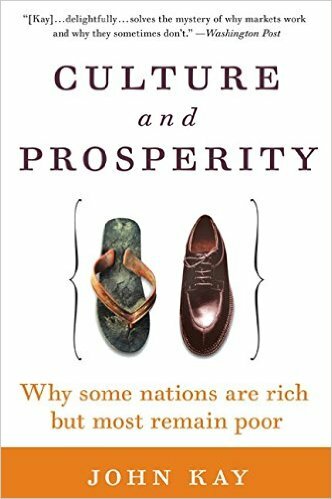 The book – Culture and Prosperity by Professor John Kay, one of the leading British economists today, is an excellent read. In this book, the professor has tried to find the answer to a very relevant question of this age: why are some countries rich and others poor? Why does a school teacher in Switzerland and a farm worker in Sweden earn much more in salaries than a programmer in Russia and an accountant in India. Why do centrally planned economies experience low productivity and economic performance while market economies generally do well (which was the reason for the collapse of the Soviet Union). And more importantly why do rich countries continually remain rich over time and would be rich in the future and the poor countries remain poor. While this is the basic question this book has dealt with, there are a lot of other issues and concepts covered in this book related to economics that make this book interesting and relevant. The primary reason for the prosperity of nations that John has discussed is specialization and comparative advantage. Referring to Adam Smith’s pin factory, where the output and productivity of a pin factory multiplies when people specialize in different tasks related to manufacturing pins as compared with when the entire pin is made by one single person, Kay states that in developed countries, jobs are highly specialized. Hence people become experts at their jobs and their productivity is world class. This coupled with the intensive use of machinery in developed nations is a reason for the high outputs and consequent high salaries that the workers enjoy. This also draws upon the principle of competitive advantage, absolute and relative. John gives the example of a painter and a cook in France. The painter paints and gives some of his paintings to the cook in return for food. The painter could cook himself and the cook could paint his own pictures but that would be sub-optimal (absolute competitive advantage). Even if the painters could cook better than the professional cook, still both parties would gain if the painters stuck to his vocation and the cook prepared the meals (relative competitive advantage). So the question companies should ask is not who is the best person for the job, but rather what can each worker do best? Rich nations tend to trade more both internally and with other countries. Similarly successful companies stick to their core competence and outsource the rest. John also explains why socialist economies like the Soviet Union and China performed so poorly under central planning. The reason was lack of coordination. In central planning, all decisions were taken by a centralised committee which on many occasions was unaware of what the ground realities were. Dissent was stifled, workers were generally forced to comply with the decisions of the central leadership without being asked for their opinion and this resulted in gross mismanagement of resources. Indeed there was excess production of certain goods and shortages of other. For example, Russia produced excess steel, but most of it was put to rust. Industries couldn’t produce, because of lack of inputs. And Prof Kay says that this is not the problem with poor planning. In any centrally planned system, the problem of overproduction and underproduction would occur, because economics is a complex system and fool-proof planning isn’t possible. In free market economies on the other hand, the adjustment of prices to supply and demand would act as an invisible hand instructing participants to increase production of certain goods and cut back on others. This Professor says is the principle of disciplined pluralism. In pluralism, decision making is decentralized and each worker and manager is given the authority to make decisions in his jurisdiction. Decentralized systems operate as small experiments, observation of results, decision making and further small experiments. Disciplined pluralism is the reason why GE has remained successful over so many years. When Jack Welch came to the helm, one of his first tasks was to dismantle the existing central planning committee at GE and giving more autonomy to his managers. Ironically, the world ascribes the success of GE to Jack Welch, when in reality, it was the result of the efforts of thousands of workers who made collective, correct, and complex decisions. The third reason why nations such as Switzerland are rich and are likely to remain so is due to the principle of economic rents. Economic rents are the excess that a factor of production (land, labour, capital) earns compared in a country with what it would normally earn in some other country or region due to scarcity or exclusivity. For example unionized workers earn more what they would if they weren’t organized. Workers in Switzerland derive economic rent and earn more from simply being based in Switzerland as compared with say Nigeria. Switzerland enjoys exclusivity from the fact that it has efficient functioning economic institutions, public infrastructure, property rights, rule of law and companies that are globally competitive. One drawback of this book is that, not all the concepts discussed in this book are relevant for the problem at hand. This book could have been much shorter and at times the reader is tempted to skip over some material. But overall this book does a good job at providing explanations for problem it is concerned with. PS: Professor John Kay is one of the Key Note Speakers at the 2016 India Investment Conference (#IIC16, @iaipcfa). Do not miss the opportunity to network with a legend. This entry was posted in Bengaluru, Book Reviews and tagged Aneek Saha CFA, CFA Institute, IAIP, Indian Association of Investment Professionals, John Kay. Bookmark the permalink.